Gaining massive amounts of weight causes the skin cells to stretch beyond capacity, which means once the excess pounds are shed, the skin will never snap back properly. This leaves extra sagging and hanging skin folds that can cause much emotional distress. Many people often prefer how their body looked when overweight than with the extra skin. Skin elasticity, no matter how much more weight is lost or how much exercise is performed, can never be regained, except through the aid of cosmetic surgery. Cosmetic procedures such as tucks, lifts, and liposuction, often referred to as body contouring procedures, can help reshape and sculpt your body after massive weight loss. 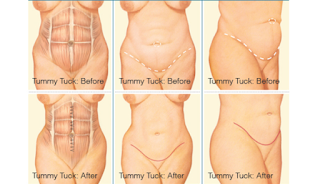 Excess skin folds are removed and the skin is once again given a tight, smooth appearance. These procedures are often very costly and have long recovery periods due to the extremity of many patients? individual cases. Be prepared to spend a lot of money and time in bed feeling uncomfortable. But, even though body contouring after weight loss can be a difficult process, the results are well worth the effort. Most people will find that areas like the thighs, arms, and stomach have the most noticeable loose skin and weakened muscles. These areas of the body are more prone to storing fat cells. For the thighs and arms, similar procedures are used to remove excess skin. An incision is made, often quite long (in the case of the arms, often extending from the armpit all the way to the elbow), and then a sheet of excess skin is excised. The remaining is sewn back into place tightly, and in some cases the muscle beneath will be tightened as well. The scars will be visible, but cosmetic surgeons try their best to blend them in with the natural lines of your body or place them in areas that can be easily concealed by clothing. Tummy tucks are like lifts meant for the stomach. They are considered a very extreme form of plastic surgery, and therefore should be carefully weighed before undergoing the procedure. Like arm and thigh lifts, a long incision is made from hip to hip, below the bikini area for easier camouflage, and then the extra skin is removed and the remained tightened. The recovery time can range from three weeks to six, and it can be a very painful process. 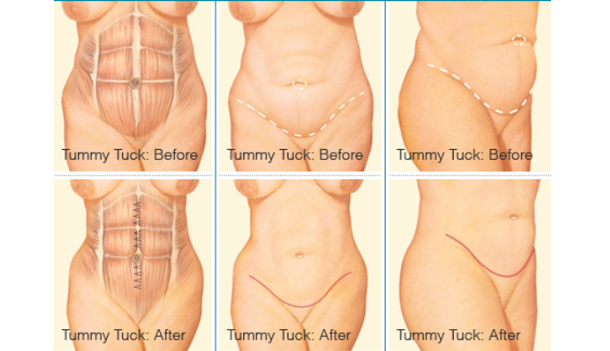 You will be fairly immobile for a very long while after your tummy tuck. Liposuction has a much faster recovery time, but will not help you shed excess skin. This procedure is used more as a tool for fine sculpting. A hollow tube is placed into the target area, which can be virtually anywhere on the body, and extra fat cells are sucked out. Liposuction won't help you lose a significant amount of weight, but it evens out any bumps and smoothes out the surface of your body. The biggest benefit of this procedure is that as long as regular exercise and a diet is maintained, the weight will not return to the treated area. The more extreme body contouring surgeries are only for those who have serious problems post-weight loss. None of the procedures will help you lose weight or gain muscle, but they can help you regain a more normal appearance and a healthier self-esteem. Research all procedures carefully and choose a qualified, board-certified plastic surgeon.